Bone scintigraphy is a valuable and attractive imaging modality for a wide range of skeletal abnormalities. Incidental findings and congenital skeletal anomalies are not uncommonly encountered. 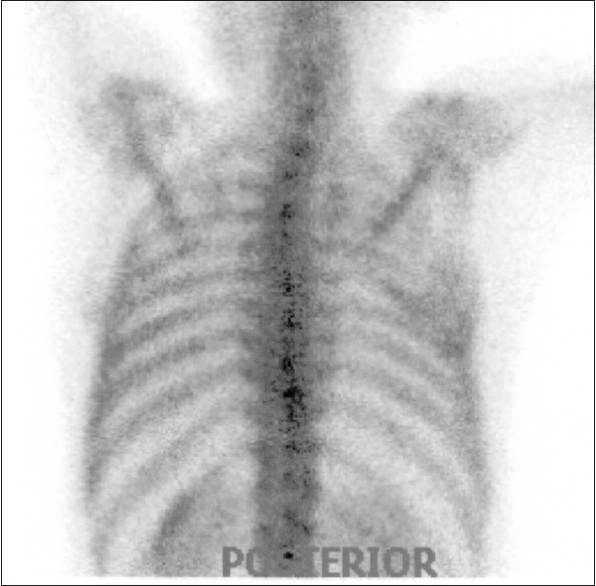 Here, we present a case of previously diagnosed malignancy referred for a bone scintigraphy for skeletal metastatic survey, in which Sprengel's deformity (SD) as congenital scapular asymmetry and cervicothoracic scoliosis was noted. A 59-year-old male with a history of concomitant laryngeal squamous cell carcinoma and lung adenocarcinoma referred to our laboratory for a whole-body bone scintigraphy for the evaluation of bone metastasis. During history taking and physical examination, we realized that shoulders were asymmetric in size, left side seemed to be smaller than opposite side. The left upper limb was weak and to some extent abnormally positioned. The patient stated that these skeletal abnormalities were congenital and did not use much his left upper limb. The patient has also been limping since his previous motor accident. 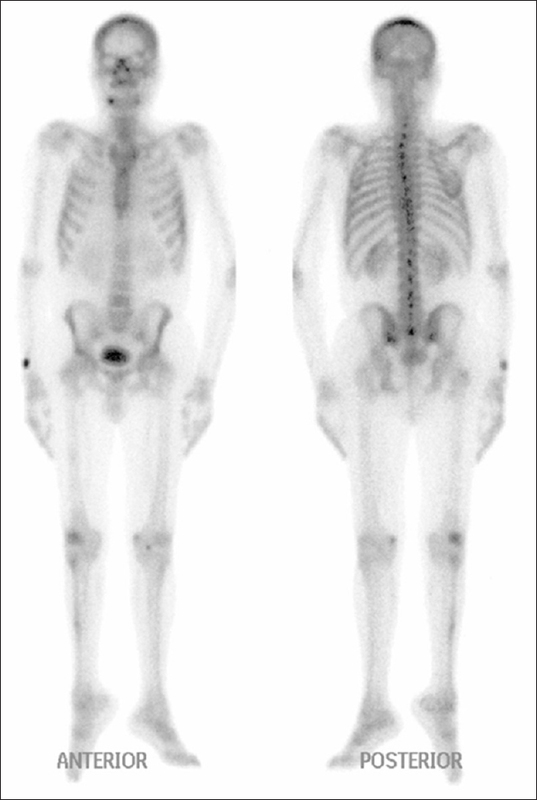 A planar whole-body bone scintigraphy and spot view [Figure 1] and [Figure 2] were performed at 2 h after intravenous injection of 740 MBq of 99mTc-methylene diphosphonate. As shown in [Figure 1], significant asymmetric size of scapulae but the normal-appearing shape and slightly higher position of the left scapula are detected. Other findings were mild cervicothoracic scoliosis as well as slightly asymmetric upper limbs. Focal uptake at midshaft of the right tibia was compatible with a recent trauma. There are a number of congenital or developmental musculoskeletal anomalies, among which some are related to scapula and shoulder.,,,, Although the bone scintigraphy is not the primary modality for evaluating congenital skeletal abnormalities, these findings are occasionally present or incidentally discovered. Although congenital anomalies of the scapula are rare, the most common of which is which can be associated with other skeletal deformities (e.g., vertebral and rib deformities, spinal scoliosis, and spina bifida).,, To date, the embryogenic etiology of SD has not been convincingly elucidated., SD has been classified as low- to high-grade according to the severity of deformity.,, Scapula is usually hypoplastic or dysplastic with abnormally elevated position.,,, The scapula on opposite side is usually normal, therefore shoulders appear asymmetric. Since there is an increasing role for bone scintigraphy in daily practice for assessment of wide range of skeletal disorders, physicians should be familiar with many incidental and rare findings, including skeletal anomalies, on bone scintigraphy. Likewise, these abnormalities with abnormal uptake of radiotracer (either increased or decreased) may pose a significant challenge to interpretation and may mimic serious lesions particularly in patients suspected of metastatic skeletal diseases. To the best of our knowledge, no case of SD on bone scintigraphy has been reported. McClure JG, Raney RB. Anomalies of the scapula. Clin Orthop Relat Res 1975;110:22-31. Guillaume R, Nectoux E, Bigot J, Vandenbussche L, Fron D, Mézel A, et al. Congenital high scapula (Sprengel's deformity): Four cases. Diagn Interv Imaging 2012;93:878-83. Currarino G, Sheffield E, Twickler D. Congenital glenoid dysplasia. Pediatr Radiol 1998;28:30-7. Simanovsky N, Hiller N, Simanovsky N. Partial duplication of the scapula. Skeletal Radiol 2006;35:696-8. Ozsahin M, Uslu M, Inanmaz E, Okur M. Bilateral congenital undescended scapula (sprengel deformity). Am J Phys Med Rehabil 2012;91:374. Williams MS. Developmental anomalies of the scapula-the “omo”st forgotten bone. Am J Med Genet A 2003;120A: 583-7. Kadavkolan AS, Bhatia DN, Dasgupta B, Bhosale PB. Sprengel's deformity of the shoulder: Current perspectives in management. Int J Shoulder Surg 2011;5:1-8.